Unique rotor design, which spreads the air seal over a larger surface, giving high efficiency at both low and high speeds. Special rotor coating reduces the chance for internal scoring against the casing and allows the supercharger to maintain high efficiency throughout it’s life. 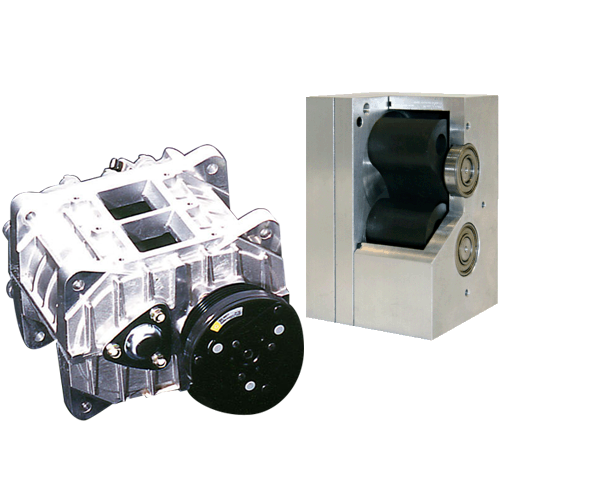 Low inertial rotors allow engagement and disengagement of the supercharger via a clutch which saves energy and increase the life of the supercharger. Caused sliding part it have less noise and less vibration, and long life time. Housing is made of finned aluminum which is lightweight and had good heat dissipation. The unique rotors are connected to each other via a gear drive and are set 90 degrees from each other. Both rotors turn in opposite directions, which causes the air to be trapped between the large face of the rotor and the housing. For every revolution of each rotor a volume of air (depending upon the supercharger’s size) gets pumped from one side to the other.